One Stop. One Studio. One Solution. Our core strength is the ability to deliver a consistent brand identity across all marketing channels. If your project also needs copywriting, photography, illustration or other highly specialized skills, we've got you covered. By providing top industry talent that's a perfect fit for your project, you benefit personally from the powerful alliances that we've forged over the years. Whatever your needs, Di Natale Design delivers. As a re-seller of design, we offer special pricing to ad agencies and marketing firms. Serving as an extension of your staff, we give you the ability to bring in highly focused talent on an as needed basis. By increasing your ability to offer a comprehensive suite of services, you're able to expand your clientele like never before. We build strong professional relationships by design. Ready to take your business to the next level? Contact us today and see what Di Natale Design can do for your bottom line. The studio works with a cross section of printers to provide the quality, services and price needed for a good match to each print project. 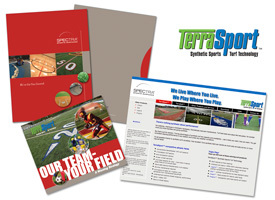 Need just 500 quick, four color, standard size flyers or brochures? Our quick 3 day turnaround solutions may be the right fit. Only need 50 of your color brochures? Digital printing might be the answer. © 2002-2016 Di Natale Design, Inc.